The nefarious Pierce (Boyd Holbrook) and Logan (Hugh Jackman) face off. Photo by Ben Rothstein. Cinematographer John Mathieson, BSC creates a gritty sense of on-location realism for this dramatic conclusion to Wolverine’s screen saga. At nearly 200 years old, Logan (Hugh Jackman) isn’t as agile as he used to be. The adamantium-clawed warrior once known as Wolverine walks with a limp, coughs, and can only tear into a bloodthirsty rage when absolutely necessary. And under Logan’s guardianship at their bedraggled desert hideout is powerful telepath Professor Charles Xavier (Patrick Stewart), former leader of the long-defunct X-Men, who in 2029 is now in his 90s and afflicted with seizures capable of temporarily paralyzing everyone around him. With the bulk of the world’s mutant population having been rounded up and dispensed with years ago, and the birthrate of new ones down to zero, Logan and Professor X are trapped without recourse, clinging to a dream of someday buying a “Sunseeker” and heading out to sea. 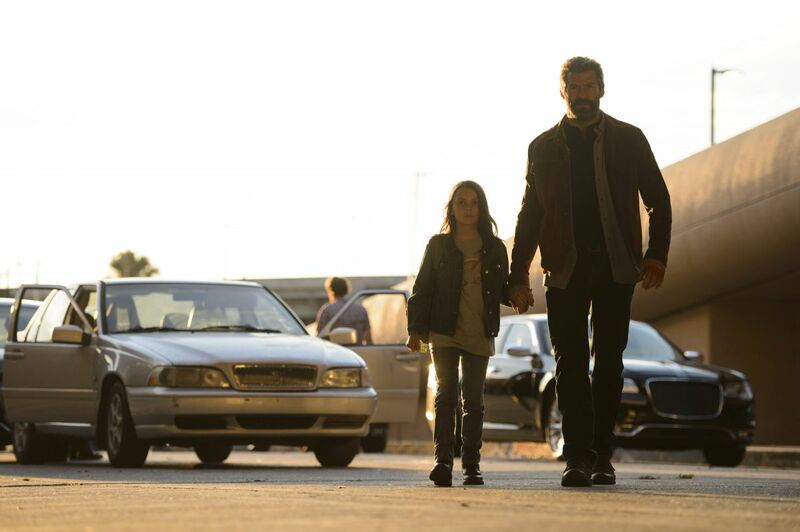 Enter a young girl named Laura (Dafne Keen) with powers remarkably similar to Logan’s, who is being pursued by a cadre of unsavory operatives. And so the timeworn heroes head once more into the breach, embarking on a perilous road trip to save the next generation. Less than a week and a half after returning to his home in London, Mathieson “got a visa sorted out and started prep,” he relates. “That was March 10 [2016, when photography began]. It’s been quite a fast film. That’s the way films should be. Director James Mangold and Jackman on the set. Photo by Ben Rothstein. Equipment included three Arri Alexa XTs and one Alexa Mini, which were mainly paired with Panavision’s E Series anamorphic lenses. In certain instances, such as when visual effects required it, spherical Zeiss primes were used, and the cameras were set to Open Gate mode to maximize resolution when cropping to match the final 2.39:1 aspect ratio. The production also carried two anamorphic zooms: a Panavision AWZ2.5 37-85mm (T2.8) and a Cooke MK2 Super Zoom 50-500mm (T5.6). Spherical zooms included a Technovision Cooke Varotals and an Optica Elite 120-520mm (T2.8). Laura (Dafne Keen) and Logan. Photo by Ben Rothstein. Greenscreen stage set up at Big Easy Studios outside of New Orleans. Charles (Patrick Stewart) and Logan. Photo by James Mangold. Another special technique was required to depict the professor suffering his telekinetic seizures, which produce a deafening sound and physically immobilize everyone nearby. “How do we [visualize] this resonating, crippling, earsplitting sound?” Mathieson wondered. “‘How do you do something like that with the camera? [Visual-effects supervisor Chas] Jarrett said, ‘Shake it, shoot it slightly wider, and I’ll stabilize it.’” The result is a twitching, restive motion-blur effect that relied on a 358-degree shutter angle, produced manually on an EasyRig by camera operator David Luckenbach and finalized by Jarrett’s postproduction techniques. Colombera used Technicolor DP Lights 2.0 and Colorfront On-Set Live, referring to footage on several Sony PVM-A250 calibrated displays. “Every time we did a film break, I exported EMD [Express Metadata Dailies] folders, which are packets of information that include all camera metadata, the grading color pipeline, ASC-CDL values and uncompressed stills for each camera,” Colombera explains. “There are lots of advantages compared to the standard ASC-CDL workflow because the dailies operator is not applying the look based just off CDL values, but can see exactly what John and I saw on set, as well as extract each camera’s metadata and settings for redundancy.” Per Mathieson’s intentions, the cameras were set at 800 ISO. “We also rated the Alexa XTs at 1,000 and 1,280, except for a couple of night shots, for which 1,600 ISO was necessary,” Colombera adds. Material intended to represent video shot clandestinely on a cellphone was recorded with Canon’s FS20, a deliberately low-res option that Colombera describes as “a consumer [grade], super-compressed, standard-definition camcorder with a 1/6-inch sensor.” Where this material depicted superpowers that required visual effects, Blackmagic Design’s Pocket Cinema Camera was used. “It had a much smaller sensor than the Alexa — actually Super 16-sized — and it could match a little bit better with the FS20, but it produced high-quality raw footage appropriate for visual-effects work,” Colombera notes. With visual effects added, this material was re-photographed with the FS20 as it played on a high-resolution monitor in order to match the appearance of the FS20-originated material.